My mother painted this and gave it to me for Christmas this year. 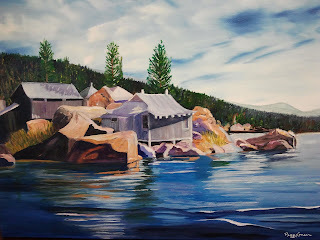 China Island, really Garstin Island, is a privately owned island in Big Bear Lake. Maude Garstin built the little Oriental style buildings in 1911. I was fortunate to pass by China Island frequently on my way to Papoose Bay to fish. Big Bear lake is a stellar fishing lake with rainbow trout, northern largemouth bass, catfish, crappie, bluegill, and even carp. Imagine having to live in such a beautiful place? Thanks mom for this wonderful gift!